This could be the year for RIM’s rebirth. The previously struggling company made a splash with Tuesday’s announcements: they’re rebranding the company name to “BlackBerry,” hiring Alicia Keys as the new Global Creative Director, unveiling the BlackBerry 10 operating system, and announcing two new phones: the BlackBerry Z10, a touchscreen smartphone, and the Q10, a smartphone with a physical keyboard. BlackBerry’s bold attempt to compete in the smartphone market could make consumers and competitors take a second look. 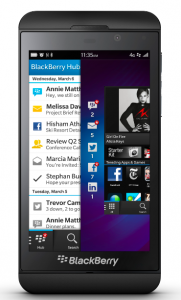 The BlackBerry Z10 features a 4.2 inch screen, unique predictive text capabilities that adapt to writing patterns, app essentials (including video, messaging, Facebook, Twitter and more), innovative software design, and a time shift camera that allows users to capture their “best” face. On the performance front, the dual-core processor with 2GB memory makes this the fastest BlackBerry to date. Considering BlackBerry’s reinvention, how do you think the company will fare against the competition in 2013? It also has a developer app for turning an apk into ta blackberry ready app…. Don’t know if it works though. Except that the reviews so far state that ported apps run very poorly because it’s an android 2.3 emulator. So anyone reading this should head over to the feedback site and vote for BB10 native support. I published a bunch of native Android kids games for Blackberry when they first released the Playbook, which was their first device with the Android emulator. The games run fine, but the main problem was that the emulator itself had issues with memory management. Don’t know if it is fixed.